I had SO much fun seeing my Cafe visitors enjoy the Epilepsy Awareness graphics set I published, that I just had to begin Autism Awareness Month by releasing the first of a series of Autism Awareness Graphics as well. But first, I wonder how AWARE of Autism you are? Has it touched your life in some way? Do you have a child or loved one diagnosed with Autism, or has this disorder impacted your life in other ways? You’d have to be hiding under a rock somewhere to miss the latest release of the CDC’s newest numbers – that 1 in 88 children have autism. I have a post coming up about my thoughts on that, along with a round up of what other special needs bloggers are saying about it. And of course, with the Autism Awareness Month itself beginning tomorrow, the Cafe will be abuzz with all kinds of posts and information on autism, personal thoughts about the reality of having three little guys on the spectrum, reviews of websites and, of course a few great giveaways that should be exciting for you all (one of them starts with an “i” and ends in a “Pad”!). I’ve joined with several other great special needs bloggers to write about autism awareness and more this month as part of the 30 Days of Autism Challenge (Interested in joining up? Request to join the Special Needs Blogging Group on Facebook to learn more). You’ll learn more about my fellow bloggers by hopping on over to visit them from time to time too! For this first set in the Autism Awareness Graphics, I’m including a couple of links to free resources available online as well. For instance, the puzzle frame at the top of this post with Andy featured, is part of a template, and you can find it at PSD Graphics. So if you have Photoshop you can create your very own! (They also included a JPEG version that you can use instead if you want (You won’t be able to layer the effect, but it’ll still be fun to play with! Also, several bloggers and I have a great board on Pinterest, called “Light it Up Blue – Supporting and Celebrating Autism.” There, you’ll find inspiration for all your Autism Awareness inspiration needs. I’m also trying to add extra graphic elements to the set so those of you wanting something for your own blog or profile images online have some graphics to play with! 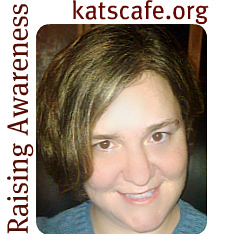 In the same spirit as my Epilepsy Awareness Graphic Set, this Autism Awareness Graphic Set is the most basic set I will offer for you to download, free, here at Kat’s Cafe. Each of the three included graphics is available in a high resolution, PNG format, with a translucent background. Hopefully you will have a chance to use these in some of your web projects throughout April, and beyond this month, in a show of support for Autism Awareness. Just click on the graphic below so you download your own set to use. 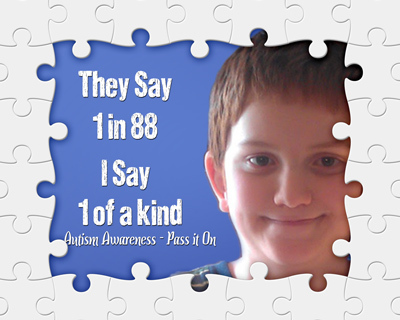 I would love if you shared the link after you use these, so we can all see others supporting Autism Awareness. 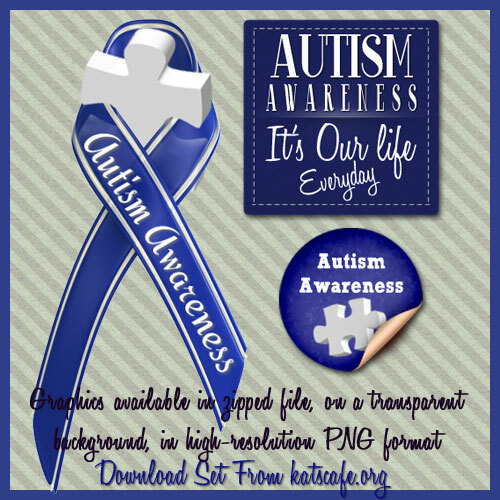 Use of this Autism Awareness Graphics set is free for personal and commercial uses, provided you are not reselling or otherwise profiting on these designs. One last Treat, and then hopefully you will share your own Autism Awareness plans for the next month. I’ll be using all these graphics and others on my site throughout the month, but I think I had the most fun with the following graphic. 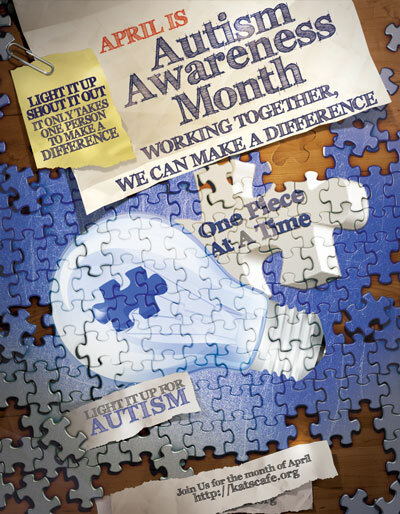 I purchased a base template to help with the puzzle pieces, and created the rest to go with it … I would be honored if you wanted to share this autism awareness graphic around … and plan to join me here at the Cafe over the next month to support Autism Awareness!